Within the Campaign tabs it is possible to use Selection Criteria for a number of things. For example you may wish to have three Emails attached to your Campaign, a Red one, a Blue one and a Green one. If you know the contacts favorite colour and you have that stored in a field against the contact record. Then you can ensure that they get the Email in their favorite colour. This same idea can be used for Landing Zones and Surveys too, it works the same for each tab that you are on. The only thing to bear in mind is if you are attaching multiple Landing Zones or Surveys the Reference numbers need to be the same so you would have three Reference number ones if you were going for their favorite colour. Click on the pencil next to the attached Email/Landing Zone/Survey. 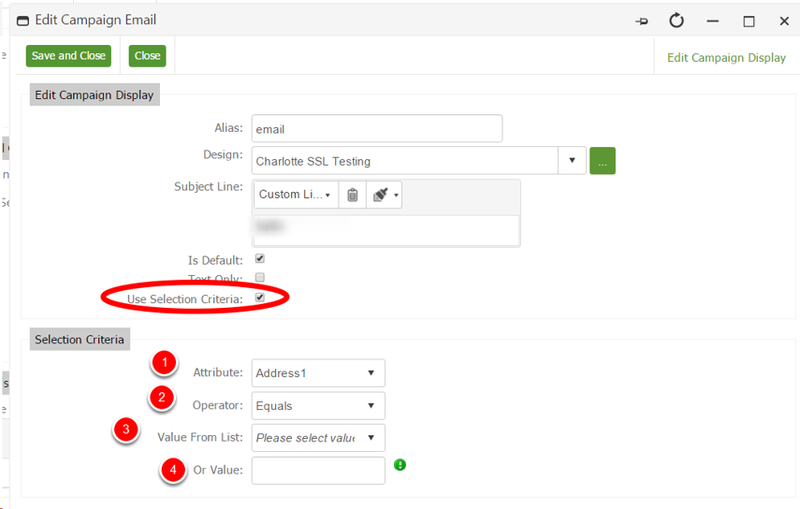 Tick the box to use Selection Criteria, this will display the Selection Criteria options. Select the Attribute you want the system to look at E.G Favorite Colour Field. Select the Operator to use. Pick a value from the list. Or manually type in a criteria. You may wish to select one of the Emails/Landing Zones/Surveys to be Is Default so if as contact doesn't fulfill the criteria they will get the Default.